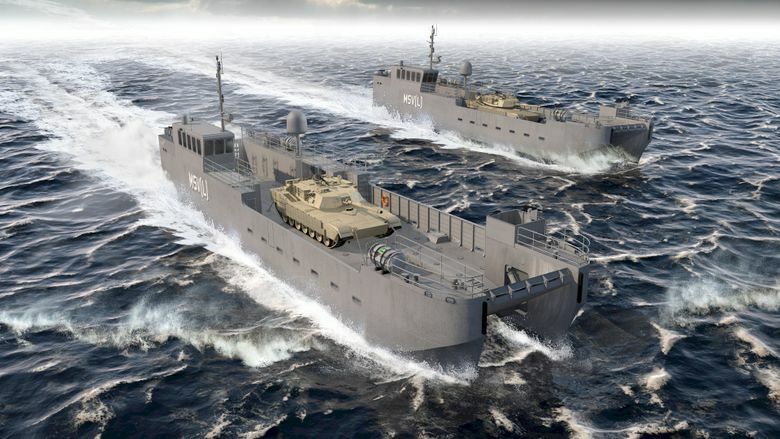 Portland-based Vigor, which operates several Puget Sound shipyards, has won a competitive contract to design and build a new generation of landing craft for the U.S. Army in a project that ultimately could be worth $979 million. CEO Frank Foti said in a statement that the design for the so-called Maneuver Support Vessel originated with Ballard-based Kvichak Marine Industries, which Vigor acquired in 2015. After refining the design and delivering a prototype, Vigor and its partners would build four vessels at a low rate and then up to 32 additional vessels. Vigor said the 10-year contract could provide sustained full time employment for roughly 200 skilled workers. A location for the fabrication work has not yet been determined, a spokeswoman said. The Army, in a statement on its army.mil website, described the vessel as able to operate in five feet of water and carry a combat-configured main battle tank, two Strykers, or four Joint Light Tactical Vehicles into a wide range of coastal environments. With a planned range of 360 nautical miles and a speed of 15 knots fully laden, “it will significantly improve the Army’s ability to maneuver land power when and where commanders need it,” the Army said.